Cream curtain poles offers you the ultimate chic finish to your stylish home décor. Browse our selection of metal cream curtain poles below and order online today! These hand crafted cream metal poles have been sourced from high quality materials and constructed into sleek looking curtain poles. 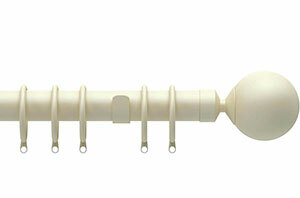 Our metal cream curtain poles come with finials, brackets and rings, along with all the fittings and fixures needed.